“But for the previous president, I was an evil man,” Duterte added. “That crazy man was planning to jail me. This other one [Trump], he said, ‘you’re right. '” Trump reportedly lent his support to Duterte’s proposal to eradicate drug crime using extreme state violence during a phone call in December. Duterte also said he was ready to “give all, whatever it is,” to be allied with the Trump administration – except form a military alliance. “We can’t handle those… Let’s not look for a fight. Someday, but not now,” he said. Duterte has especially appeared reticent to cooperate with the United States in curbing China’s expansionist moves in the South China Sea where Beijing claims territory belonging to the Philippines in the Spratly Islands and Scarborough Shoal. The Philippine outlet Rappler notes that Duterte’s attitude towards Trump is significantly more civil than that towards President Obama. Duterte went on to make the comparison in this speech as well, Rappler notes: “In his speech, Duterte recalled how he told Obama to “go to hell,” after the latter criticized the Philippines’ bloody war on drugs.” Duterte also called President Obama the “son of a whore” on multiple occasions. 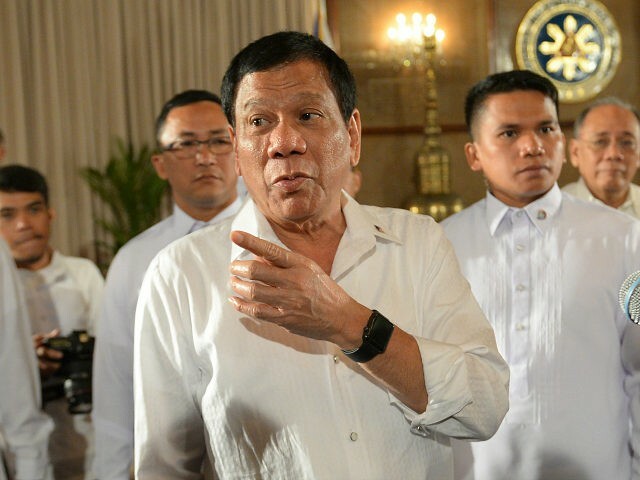 Rather than assure the international community he would follow human rights standards, Duterte said he would instead continue to give police permission to kill drug suspects. “More people will die. I said I will not stop. I will continue until the last drug lord in the Philippines is killed and the pushers (are) out of the streets,” he promised. Reuters estimates that over 8,000 people have died in drug-related police incidents since Duterte took office in June 2016. As a candidate, Duterte encouraged individuals to engage in vigilante justice against drug criminals and encouraged police to zealously pursue drug peddlers. Duterte won election to the nation’s highest office after serving as mayor of Davao City, a southern population center, for 22 years. As mayor, he gained a reputation for using violent law enforcement measures to make Davao inhospitable for organized crime, resulting in an improved safety record and turning Davao into a regional tourist destination.